A deck of cards is removed from a card-case which is shown to be empty (can you see where this is going?!) The magician says that to ensure that he cannot cheat he will perform his next trick with only one hand. A card is selected and lost in the deck. The magician, despite his earlier claims, fails to find the card. 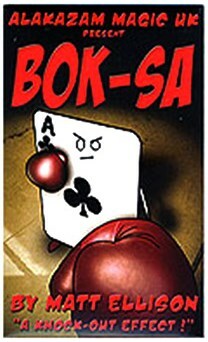 The cards are now dealt face up onto the spectator's hand and one card bears a message, "Look In the Card Case!" The magician directs attention to the card case, which has been in view the entire time - with empty hands he opens it and inside is the selection! !